It’s always such a pleasure to speak with Silva Martin, truly. The bonus for us, though, is not just that she’s lovely and bright and funny, but that she’s an accomplished and talented dressage rider who knows the sport backwards and forwards. And that puts us in a good place to gain an edge. Especially if she walks us through a dressage test and gives us tips all the way through. Like she does right here! Silva walks us through USEF Training Eventing Test A and points out key aspects of the test not to be overlooked and advice on particular movements. Do you have your pencil so you can take notes? I’d highly recommend it. Take it away, Silva. From a dressage rider’s perspective, what are the most important things to focus on in Training Level tests? Okay, I think most important thing with lower level tests is to ride an accurate test. Of course you have to have the basics like being round. But since there are not a lot of movements if you make a mistake and make circle at 17 meters instead of 15 meters you’re throwing marks away. There always will be something else going wrong so you can’t afford to lose marks where don’t need to. Know your test and know where you’re going and how big the circles are. Try to be accurate. As you’re circling the arena waiting for the bell what should you be thinking about? I think you need to focus about the first movement which is going down the center line. To think about the whole test is too much in your head. It’s kind of overwhelming. This is what I do, anyway. I have my horse in the frame I’m planning on having him in the ring and am thinking about how am I going to go into the ring and down the centerline into a halt. If you get that, well then it kind of carries through. Rather than thinking about struggling with your 15 meter circle to the right – then it’s going to happen. Focus on your frame you’re planning on having and your first halt. If there’s no halt then focus on your center line. What do you tell Boyd to think about? It’s different when riding Neville Bardos; you have to hold on and hope for your best chance – he’s going to go crazy! Boyd is such an experienced rider and very good competitor. I don’t actually have that much to do since he’s a very strong competition ride. He gets really calm, especially when he has a lot of pressure. Every time I watch him go around the ring at an important three-day he becomes really calm and it gets to the horse. It would be great if it could happen for more riders, including me. Not sure how he does it, but it’s the perfect thing to happen. What about specific movements. We start with “Enter at A, C track left.” Is that harder than it sounds? This is something also that people have to remember. When you read the test and you’re preparing for your test (Which hopefully you have – I’m surprised, event riders read their test often the morning before the event! Dressage people would never do that.) read the test from the first word to the last word. Read the test and think, enter track left. But really, it’s not that easy. It is so obvious to the judges if you’re on the center line or not when riding towards C. That first movement can have a big impact on your test. How will you turn on the center line? Don’t drift right before turning left. Keep an eye on the judge. You need to think about that before going in. “Circle right 15 m then KXM lengthen strides.” What are the judges looking for? Why a circle before the lengthen? I think the circle first of all is a tickler for judges to see if the horse is balanced. To have a horse in balance means the horse is in between both legs and in between both reins. A circle shows if the horse is not in that tunnel and if they’re not then they will turn out or they’re not round or they fall apart or drift. First thing is it’s a test of if they’re in balance underneath you. It prepares you and gets the horse back together. It collects the horse underneath your seat and then you have the lengthen. Rather than having a long horse underneath you have a horse that’s more together. “Circle left letting the horse stretch forward and down.” What’s the goal? What would be a big oops here? That’s a movement that is a very important movement but also one of the hardest and also one a lot of people do not understand. I’ve been to lots of horse trials at the lower level. A lot of riders go around then at C throw the reins at the horse and the horse goes around with his neck down. Stretching forward and down has to be with a connection. The judge wants to see the horse follow the bit down. The main thing is that they’re following your hand. You can’t throw the reins away and have a loop in both hands then you’ve thrown away the connection you have worked for in all the movements before. To throw the reins away would be a big no-no. Gradually go forward and downward towards your hand. Free walk and medium walk. It’s the only movement in the test that’s x 2. What’s that about? Why is it so important? I think it’s because the walk shows lot of different things. In dressage you have a lot of double marks like that in the walk. A free walk shows relaxation. It shows if a horse is willing to go towards the hand and if it can do the transition back. The main thing is it shows if the horse is relaxed. You can’t do it with a horse that’s excited or tight in the back. The only way to do it is if the horse is supple underneath you. It shows suppleness in the horse the most out of all the movements. If you have a hot horse then when you pick up the reins for the medium walk most horses that are a little tense will jog there. That’s important to practice there. It’s also like the center line which gets forgotten a little. We’re so busy practicing trot and canter that the walk gets forgotten. Which is dumb, really, it’s easy to practice. When you give your horse a break rather than go around talking to your friends, practice the free walk back to the medium walk. Even though you’re on a break you can still work on that. Working canter including circles of 15 m. What’s most critical here? The most critical thing in a Training level test is that the circle that is a 15 meter circle is really 15 meters. Very often many riders don’t ride that well enough. And that’s pretty easy to do. That’s not a very small circle, you should be able to make that accurate and make that circle round. The other important thing is the horse can’t drift out or push in. It should be perfectly round from E to the second quarter line back to E. That’s the most important thing. “Halt and salute.” This is your last chance. What are you looking for? Ok. So I think it’s important that once you’ve done your last movement don’t think you finish before you finish. Ride the test all the way to the last halt. It’s easy to go ‘oh god this was really good’ or ‘this was really awful’, all these things go through your head. Make sure you’re on the center line and dead straight and you halt at X, not before or after X. Especially with horses who have done a lot of tests some horses who are lazy will halt before X or the horses who are hot will charge past X. [When schooling] go down the center line lots of times with out halts or with halts in different places then halt at C in a straight line. What about with dress? Does it matter if you’re wearing black jacket with white gloves versus tweed and brown? Will the judges, even subconsciously, prefer more formal attire? This is me being a dressage rider and maybe a German. It’s not the way you look, you have to ride a good test, and it’s not about what colors you wear, but look like you’re serious and you want to present yourself well. If you go into the ring and you haven’t braided and your boots are dirty or you’re wearing something you shouldn’t be wearing then the impression is you’re there that you’re there to have fun, not to win. Not that you can’t get a good score if you ride an amazing test. 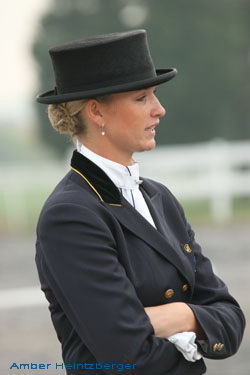 But it’s important to look the part and your horse look the part and to look like you’re serious and understand the sport. I don’t think it’s about a black jacket or anything but look like you tried hard to look your best. What if you totally flub something. Say a pack of foxhunting hounds comings baying through your test or that a suspicious and scary boulder by B chases after your horse, just as they suspected it would. What do you do? It kind of depends on what happens. If something really bad goes wrong that’s out of your control, if you’re thrown off your game, the important thing is don’t quit on the test. Put it behind you and move on. Most of the time that movement is gone. Focus on the next movement. Every movement is 10 marks. If you still have in your head ‘that was so awful, why did that happen?’ then you’re going to stuff up another 3 movements. If you can get back onto your game then you can still save it. Horses will change. You can’t be thinking ‘Why is my horse doing this, he’s never done this before?’ Adjust to the situation and make the best out of it. If they’re throwing their head up and down and you’re thinking ‘Oh my god this is awful’, adjust to and say ‘How can I make it better than I think it’s going to go?’. A good example was when Boyd went around the arena at the World Equestrian games. People started clapping when they announced Boyd as American and Neville [Bardos] lost it. Neville lost it and started charging and bucking. My heart stopped. Boyd told me afterwards he looked at the clock he had 45 seconds before he had to enter. He thought, ’Ok, I have 45 seconds to make him quiet’. He went calm and put the whole go crazy around the ring thing behind him. Collective marks. Why are those important? These marks are very important and another thing that gets forgotten a little bit. Say you come out of the ring and liked your test. Then you get your sheet at the end and it says -horse with great trot and canter but not such a good walk- you get a 6. you think, ‘How can I get a six?’. But it’s three gaits, and that drags your score down. That’s why the walk is double – it’s where it shows freedom. It’s important to have all three gaits regular and supple. The first mark is for gaits. Then impulsion. If you have a horse that’s quiet this is pleasant but if it’s a little lazy and doesn’t look like it’s enjoying it and looks a little boring then get you marks off there to. That’s another 10 marks. You need to have enough impulsion and spring in the trot and cantering underneath you. Submission. If your horse does one thing on the first center line where he doesn’t halt properly then that carries through test. Rider. Say you have a rider with a beautiful position and is a good picture. But if the horse is not submissive or is naughty then you can’t give the rider and 8, 9, or 10 because they have to go together with the horse. I do think people can’t just read to last halt but have to read the last four marks as well. Thanks for the tips Silva. Duly noted. If you’d like to learn more about Silva’s impressive dressage background or her life with one of your fave eventers, Boyd Martin, check her website or read her dressage day one and day two analysis from the WEG’s to get more of her insider’s eye. Hey, I’m Courtney and I write Three Days Three Ways: your vip ticket to go behind the eventing scenes. Meet your favorite Advanced Rider, find out if they’re single (fingers crossed! ), get tips from top grooms, or learn what makes the sport tick. Thank you – I appreciate tips from professionals. Thank you so much for the information. I am taking my first dressage test Saturday and this article was spot on!